Mark Jay didn’t know his life was about to change when he innocently went on vacation with two friends. They’d just bought a “fixer-upper” in the popular seaside town of Mazatlán, Mexico and Mark, being a visual merchandiser for Saks Fifth Avenue, agreed to help them redesign it. The turn-of-the-century home had been abandoned for many years but still had the bones of a gorgeous building. The process ended up taking several years, and Mark found himself staying longer and longer each time he visited. “Before I knew it, I was there full-time,” he says. At first, Mark lived a typical retiree’s life: exploring the city, volunteering, and just relaxing. He re-discovered his love of painting and became involved with the local artist community. The income from two rentals he owned in Bisbee, Arizona was more than enough to live on in Mexico. But soon his entrepreneurial spirit returned, and he decided to “do his dream” and open a gallery and shop. He bought a little house in the Centro Historico and turned it into LOOK Gallery, a retail shop full of art, household accessories, furniture, jewelry, and more. At first, people heard about the shop by word of mouth. The city’s monthly Artwalk brought hundreds of visitors, many of whom would return to the shop or inquire about interior design assistance for their new condos or colonial home remodels. Cruise ship passengers strolling through the cobblestone streets of the historic district wandered in to ask questions and buy art, jewelry, traditional pottery, and leather goods as keepsakes of their trip. A local expat website invited him to film six instructional “before and after” interior design videos and after that his client base exploded. Then, another lucky break: a local TV station hired him to redesign several of their sets, and from that, he became a weekly featured guest on The Mazatlán Morning Show. In its third year, Mark Jay Designs and LOOK Gallery moved to a landmark 1860s mansion. He hired employees for the retail side and was kept busy with consulting work. A notario (like an accountant) took care of the business licensing and legal paperwork—an easy process that took less time than getting a visa, Mark says. “I ended up establishing a residential and commercial design company, outfitting small businesses, spas, restaurants, and private homes.” His clients are local and international; wealthy Mexican families as well as expats from around the world. “I enjoy the clients immensely, and of course love the lower costs in Mexico as compared to the U.S., where it’s ridiculously expensive. But for me, it’s not just a financial thing; the real advantages are in the beauty of the country and the pleasure of life here. Recently, Mark let go of the shop, and started concentrating his efforts on a few private clients that keep him busy. 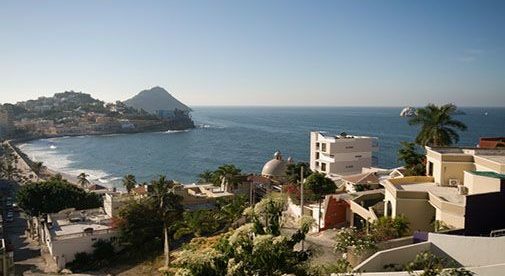 He’s also started hosting estate sales—a new concept for Mazatlán.